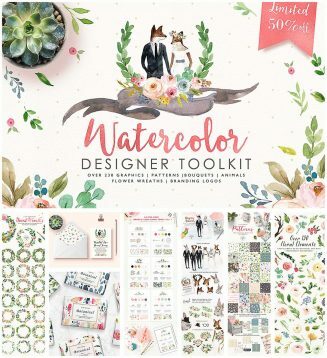 This is a fancinating collection of 229 hand drawn watercolor elements with romantic colours, bunch of graphic elements and patterns, pre-designed logo board. File format: .png for Photoshop or other software. Tags: brand identity, card, designer, floral, floral pattern, hand drawn, print, toolkit, watercolor. how can I get this template? You need to click on green “Download” button under the image (in one line with social media icons). Good luck!